You might know couscous as the “instant dish”, the package of grains you grab at the end of the week when your fridge is seriously empty and you go down the pasta aisle at the supermarket dragging your feet and your cart looking for a quick fix for tonight’s dinner. You read the directions on the back of the package. It says something like: "Don’t read this, please! Run! It’s full of baloney and the directions will ruin this couscous and your dinner, too. In other parts of the world (Especially in Algeria and Morocco) Couscous is a staple, an omnipresent dish that we serve on both happy and sad occasions. The word couscous (called “Taam" in Algeria, “seksu” in Morocco, “kousksi” in Tunisia and “Maftoul” in Jordan, Lebanon and Palestine) is derived from the Berber word “seksu”, meaning well rolled, rounded. There are as many couscous recipes as there are cooks: the couscous can be served with vegetables, all kind of seasonal vegetables, with a meat stew, with fish (whole fish, big chunks of white grouper, patties of sardines…etc) with olive oil, with butter, with honey, with preserved butter, with a poultry stew, savory and sweet, “royal” style with vegetables, meat and merguez sausage, or it can be served sweet with dried fruits, nuts and cinnamon, also known as “Seffa”. Seffa is a popular beloved couscous dish where grains of couscous are generously coated with sweet butter and gently tossed with raisins (or any dried fruits available), nuts and a dust of warm cinnamon. It’s genius! It is served at engagement parties, just after the exchange of the engagement rings, on weddings, during Ramadan, at funerals (usually made by neighbors in mounds and mounds to feed the mourners). Seffa is also served to a guest who comes to your house for the first time (I’ll make it up for you, Shayne and Christine!) After being offered courses after courses, the guest is honored with a bowl of Seffa, a symbol of welcome, hospitality, and to fully satiate him. Seffa is also very popular during Rural Fairs and banquets where pounds and pounds of couscous are made for days by the finest cooks in the village and shared with the whole village to celebrate the end of a good harvest, or to wish for a better harvest for the next year. Seffa is traditionally served in a big salad-bowl like called “zlafa”, made of wood or ceramic, set in the middle of a circular table for people to gather around. Each and everyone given a spoon would have to eat only from the nearest part of the couscous that is in front of him. It is considered very rude to “make a hole” in your part of the couscous then go to your neighbor’s “territory” and dig another hole just because he has more raisins than you do. It’s worst than the double dipping rule! 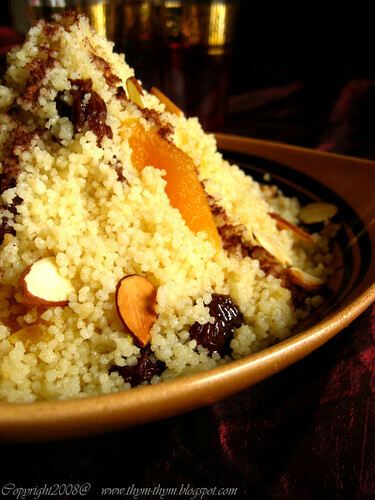 Despite being called a sweet couscous, it isn't considered as a dessert and it’s not utterly sweet since the sugar isn’t mixed into the couscous but is rather served separately in a small plate for people to add. - Superfine sugar or brown sugar to serve. Rinse the couscous in a colander under running water. Drain it well and invert into a bowl. Let it sit for 15 minutes. Meanwhile, bring a big pot of water to a boil. Fluff the couscous by rubbing it between your hands. Put the couscous in the steamer insert of your couscoussier, (if you don’t have a couscoussier, use a large metal colander that will fit tightly above the pot). Place it over the boiling water, without touching the water, reduce the heat to medium and cook for about 30 minutes or until the couscous feels dense when you tap it gently with your hand. Remove the couscous from the boiling water and invert it into a large bowl (don’t turn off the heat). Add salt, oil and one ladle of the boiling water and let it stand for about 10 minutes. Without burning your fragile hands, rub the couscous between your hands to break up any lumps. At this point, if you taste the couscous, you will find it rather dry and uncooked. Add one ladle of boiling water at a time, and continue rubbing the couscous between your hands, until the grains feel soft to your tongue. It usually takes me two to three ladles of boiling water to have a soft, melt in your mouth couscous. Rinse the steamer, or the colander, and grease it with some oil or butter. Put a layer of couscous in the steamer, then a layer of raisins and dried apricots and dates, and another layer of couscous. We want the dried fruits to steam and plump up perfectly without being mushy. Place the steamer over the boiling water again and steam for another 25-30 minutes. Turn the couscous out, with the raisins, dried apricots and dates, into the large bowl and add the butter. Stir using a wooden spoon until the butter has melted, then use your hands to fluff the couscous and break up any lumps. 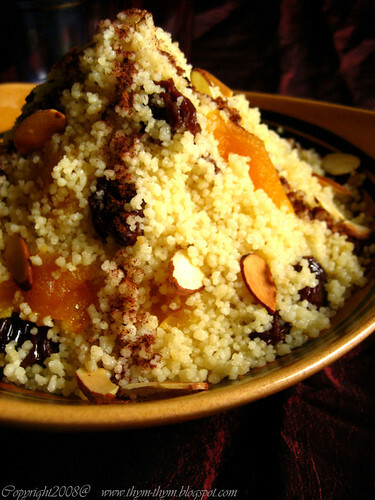 Serve the couscous as shown in the photo with the cinnamon sprinkled in stripes down the mound and the slivered almonds scattered over the top. Serve hot. Serve the sugar in a small bowl on the table for you and your guests to add to the couscous. Rinser le couscous, l’égoutter et le mettre dans un bol. Laisser secher au moins 15 minutes. Entre temps, remplir votre pot de couscoussier d’eau et porter a ebullition. Frotter les graines de couscous entre vos mains pour les separer et mettre le couscous dans la partie superieur du couscoussier. (Si vous n’avez pas de couscoussier, vous pouvez utilisez une grande passoire en fer qui se tienne fermement sur une casserole). Mettre sur l’eau bouillante et laisser cuire sur feu doux environ 30 minutes. Retirer le couscous du feu, mais sans eteindre le feu,et le transvaser dans une grande bassine. Ajouter le sel, l’huile et une louche d’eau bouillante. Laisser reposer 10 minutes. Commencer a remuer le couscous doucement et sans bruler vos petites mains. A ce stade, si vous goutez quelques graines de couscous, vous remarquerez qu’elle sont pas tout a fait cuites. Frotter les graines de couscous entre vos mains et ajouter l’eau bouillante petit a petit jusqu’a ce que le couscous vous soit doux et fondant sur votre langue. J’ai besoin d’environ deux a trois louches pour avoir un couscous tendre et fondant. Rinser le couscoussier des graines restante et le graisser avec une matiere grasse (beurre ou huile végétale). Verser e moitié du couscous puis les fruits secs et puis le reste du couscous. Remettre sur le pot d’eau bouillante et cuire encore 25-30 minutes. Remettre le couscous et les fruits secs dans la bassine et ajouter le beurre. Mélanger a l’aide d’une cuillere en bois, puis avec vos mains. Servir le couscous comme sur la photo: en dome avec la cannelle en bordures et les amandes effilées parsemée sur le dessus. Servir de suite. Servir le sucre dans une petite assiette a coté du couscous pour vous et vos invités. OOOOOOOOOOOHHHHHHHHHHHHHH how gorgeous is your couscous !!!!!! I already love it !!!!!! This one looks terribly yummy, I can't believe it ! Now that is some beautiful food. Your photos are gorgeous, Warda. Really very lovely--this is going on my to-try list. I can almost taste it already. That looks absolutely wonderful. You know I'm going to try it! All very interesting... And I love the simplicity of the actual dish. It looks and sounds like a wonderfully conforting dish. What a beautiful dish you made. I can see how plump and round your couscous grains are - nothing like the instant version I have. But, I through out that little box and will get the real stuff for future use. Seriously though, I liked reading abou the cultural and religious importance of couscous. I'm looking very forward to trying this recipe out soon. I have a confession…I tried making your couscous after having it at your house. I do not have a couscoussier so I tried to do it with my steamer pan insert and it ended in failure. I was so sad, it was dry and dinner was late so the kids were cranky. I will have to try it again allotting myself more time and another method. As you know Zora loves couscous and asked for it just the other night (Tuesday), I made it with boiling water and the “dump” method. The kids ate it but all I could do is think about how good yours was and I can imagine it is wonderful with dried fruit. Your version sounds really, really fabulous. Cinnamon and dried fruit? Brilliant! Lovely couscous. It has been so long since I have enjoyed it, but I am not sure I have ever had a sweet version, only the savory. Great to know it is such a dish of hospitality. Looks delicious! My family loves couscous. - Marion, thank you very much, my dear friend!I am sure your mother's couscous was delicious, otherwise you wouldn't made a difference between it and the one you had at school. - Mrs,W, thank you very much! I hope you will like it! - Lydia, I know how much you like these kind of dishes. I read you made one a couple of weeks ago. Too bad there was no photo! I bet you make an incredible couscous. But one day, you should really try steaming it! I know you can do it. Just like I know you make incredible tajines. - Aforkfulofspaghetti, it is very comforting and also very elgant at the same time. I love it! - Christine, I know! I am bad! Will you ever forgive me? I will show you very soon how to steam the couscous and how to make Seffa to make it up ;)Bisous. - CollyWolly, you are so nice to me my dear. And you are absolutely right about pairing it with a lamb tagine. Sweet,savory and so delicious! Now, I am the one who is salivating just thinking about it. - Shayne, Too bad it didn't work out for you! I will have to have you over and show you exactly how to make it. This time we'll have the sweet version, which is easier than the stew I made last time. - Recipegirl, thank you very much! On eof my favorites, too. - Gretchen, it's never too late to have some couscous. The sweet version isn't as famous as the savory one, but it is delicious and very easy. - Marye, thank you! I am glad you like it. Steamed....the only way to go! Anything else is a shame my grandma would say...and I think she made the best couscous (the whole dish with the chickpeas, courgettes, lamb, merguez, harissa and broth)...but again I will never refuse a serving of yours!! Looks wonderful! I have pork in the fridge for dinner tonight and I think this would be a great accompaniment. I agree couscous from a box is a shameful. Especially when it's so easy to prepare. I saw a similar recipe on PBS last week and have been dying to try it. Your lovely photos just pushed me over the edge! I must make this tonight. - Eglantine, merci beaucoup, ma chere! - Journey of life, your blog name alone makes me hungry! And your photos look delicious as well. - Annie, I hope you will like my cooking ;) See you very soon! - Helene, I knew we'll be on the same page on this topic, my dear friend. Oh! I'm sure your Your grandma's royal couscous must have been delcious! - Eileen, thanks a lot! I hope you liked it. - Gigi, Too bad I missed it. What show was it? Glad I pushed you over the edge ;) Hope you enjoyed it. i LOVE trying new couscous recipes!! i'm also glad that you use the real couscous and not the instant 5-minute stuff. your pictures look fantastic. i'm enjoying your blog - keep posting! - Antonio, thanks for stopping by. Your blog is lovely as well. - Maida, j'ai vraiment hate d'essayer ton couscous car je suis toujours a la recherche de nouvelles recettes de couscous, surtout quand il s'agit de sale sucre. Je n'hesiterai a te demander de l'aide si j'ai des questions. Hi Warda, yesterday I've found your great couscous recipe - thank you, I've cooked it and it was really delicious :-) Best! Hi Basia! Thank you for stopping by! I'm so glad you enjoyed this couscous. And BTW, thank you for letting me know about the article. I've alreay sent them an e-mail and the photo has been taken down since they didn't even have my permission. Thank you again!